- Publisher "So often the call to "dialogue" masks a requirement that we set aside our deepest convictions on important questions. This book should be required reading for everyone who is about to enter into a potentially divisive debate." This breakthrough guide introduces a powerful armistice for those battling the Christian culture war Dialogue.' As a basic healing practice, dialogue enables people to discuss issues and disagreements in ways that allow them to learn from each other without attempting to demonize or convert the other's thinking. Dialogue enables Christians at the grassroots level to effectively speak for themselves and listen deeply to each other, discussing fundamental disagreements in open, constructive, and mutually respectful ways. Pinpointing what separates the Christian left and right, More Light, Less Heat provides the tools individuals need to constructively engage in dialogue, demonstrating how participants can strengthen their arguments and bring forth a mutual understanding of their adversaries. In ways that will decrease the isolation and anxiety that often accompanies such faith-based debates, the author offers clear and concrete models to help participants better articulate their beliefs while understanding the beliefs of others. 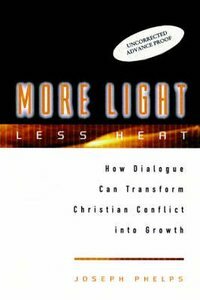 About "More Light Less Heat"
"So often the call to "dialogue" masks a requirement that we set aside our deepest convictions on important questions. This book should be required reading for everyone who is about to enter into a potentially divisive debate."